The storm unleashed by Netanyahu when he addressed the Zionist Congress garnered responses from beyond the borders of the state of Jews, responses ranging from the tagging of Bibi as one who lost contact with reality to insults at his gross impertinence.Within this colourful batter of responses it was difficult to find one that clarified the logic in the insanity behind Bibi’s decision to invent history that would tie the Palestinians with the Nazis. Until a few months ago, during the fight against the nuclear agreement with Iran, the role of Nazis was saved for Iran. 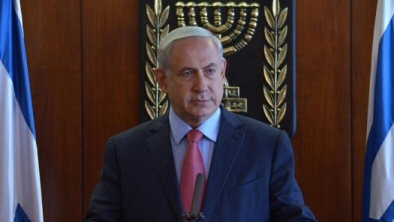 Several weeks ago, when discussions were held in the EU concerning the need to label settlement products, Bibi had a similar response: He declared that Europe had forgotten too quickly the period in which humans were labeled as non-humans, and he compared the labelling hand cream with the labelling of humans. This isn’t only provocative demogagery, but additional proof of how Netanyahu endlessly describes how the enemies of Israel are plotting to destroy it and bring about another Holocaust. Netanyahu is now essentially telling us that the main regional power will be defeated by children and youth who set out on sacrifical actions using stones and knives against a massive military system. This wave of sacrificial acts by Palestinian youth began after a lengthy period in which Netanyahu permitted messianic Jewish provocateurs to violate the status quo in Jerusalem’s al Aqsa. Netanyahu blamed the Palestinians, including the Palestinian Authority (which serves as an Israeli flak jacket) for incitement and creating this current uprising, even though hatred of the Palestinian youth who conduct sacrificial operations is divided between Israel and its servant, Abu Mazen. During this period there was also increased oppression against Palestinians, both in the 1967 territories and within the official borders of the state of Jews. It appears that the increase of messianic tendencies of Netanyahu and his government are pushing the entire country to journeys of murder, terror and revenge. The Jewish leadership is again fitting the state of Jews and its residents into the straitjacket of the Zionist mantra “In every generation they rise up against us.” This false slogan has always served as justification for the crimes of Zionism. The enlistment of Haj Amin al-Hussein to Netanyahu’s scenario and his role as initiator of the destruction of European Jewry is not solely an attempt to sow hatred amongst Netanyahu’s flock, but an intentional exercise in arousing mass fear of the Mufti’s imaginary successors, such as Abu Mazen. Joseph Goebbels, the smiling Nazi minister of propaganda, terrorised the Germans with the contention that Germany is under attack by world Jewry, and thus brought about national unity against the Jews. Moreoever, frightening the German population from the “filthy schemes of the Jews” was one of the ways Nazis created delegitimisation and dehumanisation of the Jews in Germany, and it worked superbly. Netanyahu uses a similar method when he presents the victims of Israel’s deepening occupation and oppression as cruel foes, aiming to destroy the Jews. Expoosed here is Netanyahu’s reversal method, in which he projects onto the other side his own plans in order to justify actions against the Palestinians as “self defense”. Inflating the importance of the Mufti, who was a British-appointed leader, received bribes from the Jewish Agency and actually helped Zionism with his grandiose positions, is like all truths of Netanyahu: a factual and historical lie which hides political plans. The new level of lies illustrates that Netanyahu’s future plans have reached a stage requiring vigorous preparation of public opinion, preparation for which reality can provide no assistance. When Netanyahu’s political plans are analysed it is obvious he has no intention of relinquishing Israeli control over occupied territories, and will not permit any rights for Palestinians in the greater apartheid state. Netanyahu’s intention is to attempt and expel the Palestinians in every possible way from the expanded Jewish state and to erase them from the face of the earth. It appears he believes all the Zionist parties will support his actions, just as they supported his foolish and failed war against the nuclear agreement with Iran and the accusation of the Palestinian Authority of incitement and support of anti-Israeli terror. The forces at Netanyahu’s disposal for implementing his plan to expel the Palestinians and enlist the people of Israel to this campaign are, first and foremost, the complete lack of an opposition, both inside and outside of parliament, which challenges his leadership. There is no political figure in the entire Zionist system who can take into her or his hands the leadership of sinking Israel. Various in-depth polls show that Netanyahu has managed to establish himself as a leader for more than 55 percent of Israel’s population. Also at his disposal, of course, are the settler storm troops, with whom Israeli governments have divied up the oppressive power of the state, and which will be happy to take part in such a plan. The Israeli army, which has been completely transformed in the past 25 years: its central command represents a national-religious and even ultra-orthodox nationalist force. A large part of this command follows rabbis of the Judeo-Nazi variety, which perceives Palestinians as the mythical Amalek. Add to this Israel’s tamed media, which serves primarily as a sub-agent of the Israeli military spokesperson, as well as a reminder that amongst religious Zionists there exists an expanding group dreaming of “death camps for Amalek”, as reported by Yair Ettinger in Ha’aretz on 21 January 2011. In his article, Ettinger quotes from the popular newsletter entitled Hayeshua, distributed free in synagogues and published by an association of the same name, whose heads are Rabbi Shmuel Eliyahu from Safed, Rabbi Shlomo Aviner from Beit El and Rabbi Yaakov Ariel from Ramat Gan. According to Ettinger, the fire and brimstone of this group is saved primarily for rabbis who disagree with the association’s leaders and primarily for Tzohar rabbis (considered moderate – AIC)…which it dubs “career rabbis”. The unsigned article contends that “the career rabbis” are only minor players amongst rabbis in Israel and it is doubtful they took part in “the history of our cultural struggles…it is interesting whether concentration of the Amaleks into death camps they will leave to others or perhaps they will rule that this is no longer relevant. Time will tell.” Of course, no legal advisor or other authority, including those shouting about Palestinian incitement, did not blame the document’s authors for planning death camps or inciting for genocide. This catastrophic situation is a result of the failure of the Zionist movement, which attempted to create a modern nation on the basis of a myth. The non-separation of religion from state resulted in the creation of a caricature of a nation on the basis of religion. The simple idea that the nationality of the Israeli citizen can simply be Israeli did not come to mind at all as Zionism is occupied with separating and not connecting Jews from others. Yet if the residents of the apartheid territory in Palestine wish for life, they must completely reject the idea that a Jewish state is an institution that can hold a community of people living in a democratic fashion. It is therefore not possible to separate the Jewish religion from the Jewish state without annulment of the latter. The current situation serves as a sharp reminder of the urgent historic need for the establishment of a secular democratic state, through establishment of a constituent assembly of all inhabitants of historical Palestine, an assembly that will issue an egalitarian constitution for this divided land, and will establish a state in which religion or lack thereof is the private matter of each citizen, and that the nation will include all of its citizens. More at AIC’s official website.